(Owned by Parrish and Heimbecker, Paterson Global Foods, and North West Terminal) Vancouver, South Shore Burrard Inlet Alliance Grain Terminal Ltd. Alliance Grain Terminal is a leading Canadian farmer-directed agri-business and one of Canada’s largest grain handling businesses. It handles grain and grain products. It is one of the oldest grain terminals at the Port of Vancouver. Cargill Vancouver, North Shore Burrard Inlet Cargill Canada Cargill is a grain terminal and one of Canada’s largest agricultural merchandisers and processors. It handles wheat, durum, canola, barley and grain by-products. Cascadia Vancouver, South Shore Burrard Inlet Cascadia Port Management Corp. Cascadia a grain terminal and handles wheat, durum, canola, barley, rye, oats and by-products. Cascadia is owned by Viterra and Richardson International. Chemtrade Chemicals Vancouver, North Shore Burrard Inlet Chemtrade Electrochem Inc. Chemtrade Chemicals is a chemical terminal that handles bulk sea salt imports and caustic soda and sodium chlorate exports, used in the bleaching process of paper products. Fibreco Vancouver, North Shore Burrard Inlet Fibreco Export Inc. Fibreco is a terminal that handles wood chips and wood pellets. It is one of the largest export wood pellet handling facilities in the world. They have recently expanded operations to build capacity for agri-products. IOCO Port Moody, Burrard Inlet East Imperial Oil Ltd. IOCO is a petroleum terminal that handles heavy fuel oil, intermediate fuel oil, and marine gas oil. IOCO Terminal began operations in 1915. Lantic Inc. Vancouver, South Shore Burrard Inlet Lantic Inc. Lantic Inc. is the leading refiner, processor, distributor and marketer of Rogers Sugar brand products in Western Canada. The terminal also handles and distributes other sugar products throughout Western Canada in addition to handling bulk raw sugar imports. Neptune Bulk Terminals Vancouver, North Shore Burrard Inlet Neptune Bulk Terminals (Canada) Ltd. Neptune Bulk Terminals is North America’s largest multi-product bulk terminal. It handles Canadian metallurgical coal and potash for export, and imported phosphate rock. Pacific Coast Terminals Port Moody, Burrard Inlet Pacific Coast Terminals Co. Ltd. Pacific Coast Terminals is the world’s largest and most automated export sulphur and bulk liquids marine terminal. It handles sulphur, canola oil and ethylene glycol. Pacific Elevators Vancouver, South Shore Burrard Inlet Viterra Inc. Pacific Elevators handles canola, flax, peas, wheat and other grain products. Viterra Inc., who owns Pacific Elevators, operates Canada’s largest grain handling network. Pacific Elevators was built in 1915 and was one of the original grain elevators at the Port of Vancouver. Parkland Terminal Burnaby Parkland Refining (BC) Limited Parkland is a petroleum terminal that handles petroleum products. The Parkland Terminal was previously known as the Stanovan Terminal. Richardson International Vancouver, North Shore Burrard Inlet Richardson International Ltd. Richardson International is a major exporter of canola and cereal grains to trading economies along the Pacific Rim. It handles wheat, canola, barley, rye, flax, grain and feed products. Richardson International was established in 1928. Shellburn Burnaby Shell Canada Ltd. Shellburn is a petroleum distribution terminal that handles petroleum products. Suncor Energy-Burrard Products Terminal Port Moody, Burrard Inlet Suncor Energy Burrard Products Terminal handles petroleum products. Suncor is one of the largest integrated oil and gas companies in Canada. Univar Canada Terminal Vancouver, North Shore Burrard Inlet Univar Canada Univar Canada Terminal handles caustic soda solution and ethylene glycol, and is a leading chemical distributor in Canada. Vancouver Wharves Vancouver, North Shore Burrard Inlet Kinder Morgan Vancouver Wharves offers services for bulk shippers moving products to and from all regions of Western Canada and the Pacific Northwest. It handles bulk mineral concentrates liquids, sulphur/fertilizers, specialty agri-products and other dry bulk commodities. West Coast Reduction Vancouver, South Shore Burrard Inlet West Coast Reduction Ltd. West Coast Reduction is a leader in the rendering industry, operating technologically advanced rendering plants of fat and oil products. It handles inedible tallow, feather meal, poultry meal, blood meal, fish meals and fish oil and exports canola oil. Westridge Marine Terminal Burnaby Trans Mountain Pipeline Corporation Westridge Marine Terminals handles petroleum products. The terminal can accommodate Aframax sized liquid bulk carriers. Westshore Terminals Delta, Roberts Bank Westshore Terminals Limited Partnership Westshore Terminals is a coal and coke (fuel with few impurities and high carbon content) export terminal. 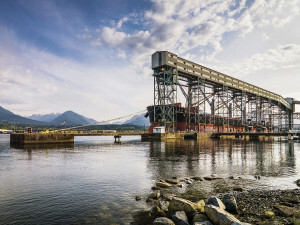 Westshore Terminal is Canada’s largest coal terminal. Dry and liquid bulk cargoes account for approximately two-thirds of our annual tonnage. Bulk carriers regularly call on us because of the diversity and the availability of western Canadian commodities available for export. As a result, we have a full range of cost-effective maritime and transportation services.